This paper explores national governments’ prioritization of environmental matters within their e-government websites, in order to provide empirical evidence related to the way “green” issues are articulated in different countries’ policymaking agendas. Through a multi-pronged methodological approach combining frame analysis, factor analysis, inferential statistics, and qualitative interpretation, explicit and visual allusions related to environmental policies, initiatives, challenges, and agencies in the home page or main portal of the national governments for 189 UN members were coded. Results show that only 39.1% of the analyzed e-government sites included environmental references, and no strong pattern characterized the framing of environmental concerns by governments. Correlation and regression analyses revealed that GDP per capita and contribution to global CO2 emissions have more weight than other variables in a nation’s propensity to highlight environmental issues within their e-government websites. Findings are discussed in light of framing theory, as well as in light of implications for governments’ public image and for actual environmental advocacy. Initiatives related to the development of e-government and online public services are underway in almost every nation in the world (United Nations, 2008). As a movement towards digital governance gradually becomes a global reality, it is necessary to gauge ways in which national policy agendas are effectively reflected by categories included in different nations’ e-government sites and portals. It is the objective of this project to explore environmental references in such spaces, in order to assess whether and how ecological matters are addressed, as well as how external determinants and broader structural factors generate differences in national approaches to the subject. The relevance of this study is highlighted by a mainstreaming of concerns related to climate change, and by the increasing number of nations that are adopting measures aimed at promoting environmentally sustainable development (European Commission, 2008; United Nations Department of Economic and Social Affairs, 2009; United Nations Development Programme, 2007; United Nations Environment Programme, 2009). In that sense, the inclusion of “green” references in national e-government portals could provide an indicator of the extent to which environmental matters are prioritized within governments’ programmatic decision-making (Navarra & Cornford, 2003; Qureshi, 2005). 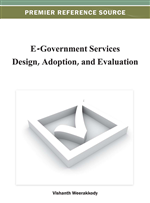 Moreover, while the scholarly literature on e-government has experienced significant growth in the last decade, this production remains focused on a limited range of topics, mostly related to e-government’s infrastructure, dissemination, functionality, and/or its social or administrative context (Anderson & Henriksen, 2005; Chen & Dimitrova, 2006; Chen et al., 2007; Heeks & Bailur, 2007; Yildiz, 2007; West, 2008; Zambrano, 2008). We deem important shedding light on the virtually unexplored connections between e-government and national environmental initiatives (Lim & Tang, 2007; Zavetoski & Shulman, 2002), since the protection of intergenerational rights to clean and abundant natural resources passes through both the inclusion of the matter in the “main menu” of governmental strategies, and its framing as an issue of crucial public interest. In order to assess national governments’ prioritization of environmental issues, our project addressed three specific questions: 1) the extent to which environmental references are included in the home page of each of the 189 UN members reported as having an online governmental presence by 2008 (United Nations, 2008); 2) the way in which environmental references, when present, are articulated; and 3) the extent to which broader national characteristics in terms of income, development, environmental track record, stage of deployment of e-government structures, and contribution of tourism to gross domestic product (GDP) affect the inclusion and nature of environmental references in e-government portals. In answering these questions, our project combines methodological approaches from frame analysis, factor analysis, descriptive and inferential statistics, and qualitative interpretation, to explain factors affecting inclusion/exclusion, placement, and adoption of particular rhetorical strategies by national government in their dealings with environmental issues within e-government sites.